Sweaty and out of breath, Paul Krugman has written an attack piece on Ron Paul and gold. He smugly titled his piece, The Old Man and the CPI. I don’t watch financial news, but CNBC was on in the gym, so I was treated to a long ad from Ron Paul, who wants you to buy his video explaining the coming crisis brought on by loose money. And I found myself thinking about the remarkable fact that there really are people who will buy that video. After all, Ron Paul has been making the same prediction year after year — in fact, he’s been making this prediction at least since 1981! — and has been wrong year after year. It’s hard to think of a doctrine that has been as thoroughly refuted by events as goldbug economics. Well, Krugman is right about one thing, gold has been a favorite investment of Dr. Paul's for a long time. 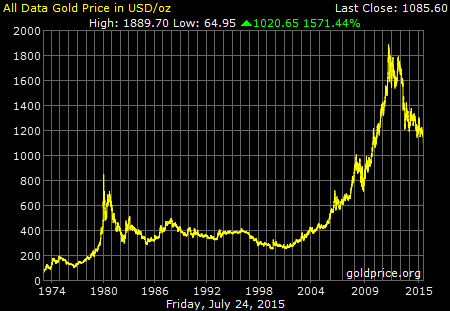 Though, I suspect Dr. Paul was buying gold long before 1981. My guess is he tucked away quite a bit when it was $35.00 per ounce. But let's take the year 1981 that Krugman references. Gold traded as low as $390, 00 an ounce and pretty much stayed in a trading range around $400.00 for aprox. 15 years. So if Krugman is correct, and Dr. Paul has been making the "same prediction year after year," since 1981, let's see how things have turned out for Dr. Paul in the investment arena.